9 Reasons to Use Oregano Oil With Caution. The Side Effects!!! Oregano (Origanum vulgare) is a herb first cultivated in the Mediterranean over 2,500 years ago that has many unique health benefits. However, today we are going talk about oregano oil side effects. As a medicinal and culinary herb, oregano is from the mint, or Lamiaceae, family. Medicinal grade oregano is distilled to extract its essential oil, while it takes over 1,000 pounds of oregano to make just one pound of oregano oil. Its unique and pleasant smell is due to pinene, thymol, limonene, ocimene, caryophyllene, and carvacrol. But, the most predominant healing compound in oregano oil is carvacrol, and research supports the antifungal, antibacterial, anti-parasite, antiviral, antibiotic, and antioxidant properties of this incredible oil. Although the health benefits are quite impressive, there are also oil of oregano side effects you need to know about. 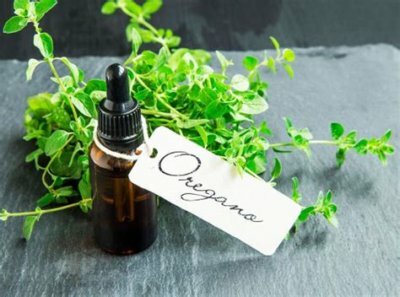 Because of its strong potency, the medicinal use of oregano oil should be administered only under the guidance of a naturopathic doctor or natural practitioner. Oregano oil is well known to treat digestive problems, including bloating, abdominal pain, stomach cramping, diarrhea, and intestinal parasites. This is due to the antifungal, antiparasitic, and antiviral properties of oregano oil. However, this herbal oil is extremely strong, and when taken in large amounts, oil of oregano can cause upset stomach or irritation of the gastrointestinal tract. It is recommended to dilute oregano oil with a carrier oil like jojoba oil before using oil of oregano for any reason. Oil of oregano is also thought to be unsafe for diabetics, since it might lower blood sugar levels. Therefore, people with diabetes should use caution while taking oil of oregano. In vitro and animal studies suggest that oregano extract may reduce blood glucose levels. Also, medicinal amounts of oregano may have additive effects when used with other supplements and herbs that lower blood sugar levels. This is thought to increase the risk of hypoglycemia in some diabetic patients. Some herbs and supplements with hypoglycemic effects include Siberian ginseng, psyllium, Panax ginseng, horse chestnut, garlic, fenugreek, devil’s claw, chromium, bitter melon, and alpha-lipoic acid. Oregano oil can interrupt the regular absorption process and prevent a person’s cells from getting enough iron. If you use oregano oil on a regular basis, it is a good idea to also take an iron supplement. Better yet, consume lots of iron-rich foods like spinach, romaine lettuce, kale, and lentils. Oregano oil may also cause systemic allergic reactions. Research shows that if you are allergic or hypersensitive to plants from the mint family, such as mint, thyme, sage, lavender, hyssop, marjoram, and basil, there is a good chance you will develop a minor to severe allergy to oregano oil as well. Some of the common allergic reactions to oil of oregano include trouble breathing, itching, irritation, skin rashes, difficulty speaking, vomiting, nausea, and swelling of the tongue, face, and lips. Oregano oil may also increase the risk of bleeding in people with bleeding disorders. Preliminary evidence suggests that the aristolochic acid isolated from oregano leaves have anti-thrombin, or anti-clotting, activity in in vitro experiments. Reports indicate that oregano oil inhibits arachidonic acid-induced and ADP (adenosine diphosphate)-induced platelet aggregation (clumping of the blood cells). As a result, the use of oil of oregano and other herbs may affect platelet aggregation and increase the risk of bleeding. Some of these other herbs include ginger, garlic, turmeric, clove, angelica, and red clover. Oregano oil may also enhance the effects and side effects of anti-platelet and anticoagulant drugs, such as heparin, warfarin (“Coumadin”), dalteparin (“Fragmin”), aspirin, clopidogrel (“Plavix”), and enoxaparin (“Lovenox”). What are oregano oil side effects on heart and circulatory systems? As a natural mild stimulant, oregano oil temporarily increases heart rate and blood pressure. Those who consume very high doses of oregano oil may notice a sudden increase in their heart rate, which can produce nausea, headaches, chest pain, heavy sweating, and dizziness. Also, people with clogged arteries or chronic infections that take large doses of oregano oil over several days or weeks may also temporarily experience increased blood flow and strength of heartbeat. Oregano oil is also considered a natural blood thinner. Therefore, it should be avoided at least two weeks prior to a surgery, or when you are taking any of the anticoagulant drug therapies mentioned above. Oil of oregano promotes anticoagulation, and this increases the risk of bleeding while also leading to further complications. The tannins in oil of oregano may also interfere with zinc absorption. So, if you take oregano oil on a regular basis, it is a good idea to take a high-potency multi-vitamin and mineral with lots of zinc. It is also a good idea to eat lots of zinc-rich foods, especially grass-fed beef, asparagus, pumpkin seeds, sesame seeds, broccoli, and collard greens. What about oregano oil side effects and pregnancy? In general, is oregano safe in pregnancy? Regular consumption of oregano oil can be dangerous for a growing fetus in the uterus. Pregnant women should avoid oregano oil, since it can stimulate blood circulation and sudden uterine contractions within the womb, and this may weaken the lining of the uterus. Evidence supports the fact that taking high doses of oregano oil can lead to spontaneous abortion or miscarriage and possible harmful effects in the future mom, such as sudden uterine contractions that can induce vaginal bleeding. Consequently, women in their first trimester of pregnancy should avoid oregano oil consumption. Iron is also important for women during pregnancy. Since oregano oil can interfere with the absorption of iron, the body’s basic need for iron is likely not being met during this time. Oregano oil is a major player in the health industry as a natural antibiotic, antiviral, and antifungal with many other powerful health benefits. Although the health benefits of oil of oregano are well documented, there are also important oregano oil side effects. Oregano oil side effects include stomach upset, pregnancy problems, blood thinning, heart palpitations, bleeding disorder, allergies, and possibly reducing blood sugar levels. Oil of oregano may also inhibit iron absorption and lower the absorption of zinc. High doses of oregano oil are also thought to be intoxicating to the internal system due to the large amount of thymol. This can make the body very toxic; therefore, starting with low doses is always best. Certain ingredients in oregano oil can also destroy pathogens in the body and release toxic substances into the bloodstream. This can produce die-off symptoms that include nausea, headaches, tiredness, and vertigo. However, heavy water consumption can help flush these toxins from your system and prevent the symptoms. And remember; always use caution while using oil of oregano, and preferably under the guidance of a naturopathic doctor or natural health practitioner. Are Oregano Oil and Olive Oil Effective Against Toenail Fungus? “Oregano,” Natural Medicines Comprehensive Database; http://naturaldatabase.therapeuticresearch.com/(X(1)S(wvpspm45p5m5fm3qnxulpz45))/nd/PrintVersion.aspx?id=644&AspxAutoDetectCookieSupport=1, last accessed Oct. 19, 2017. Benito, M., et al., “Labiatae allergy: systemic reactions due to ingestion of oregano and thyme,” Annals of Allergy, Asthma, and Immunology, May 1996; 76(5): 416-418, doi: 10.1016/S1081-1206(10)63456-4. Mateljan, G., The World’s Healthiest Foods: Essential Guide for the healthiest way of eating (Seattle: George Mateljan Foundation, 2007), 762, 802. Perry, D., “Oregano oil side effects,” Tpharm.info, Dec. 17, 2014; http://openmedi.org/oregano_oil_side_effects/1958.html.